Tuesday is my ironing day. I found three vintage pillowcases when I unpacked a box of fabric. 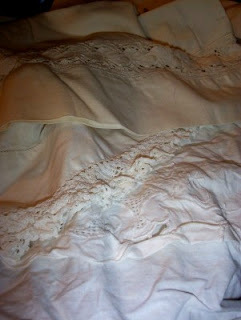 After starching shirts, it will be a pleasure to press these lacy details into crisp edges. 25 cent vintage pillowcases can mix and match with whimsy. Even if you don't change the sheets often, switching pillowcases midweek is a nice refresher. It's worth the small bit of effort on your part--especially when everyone in the family is still coughing! Meredith-Just a point. I asked my brother, who is a doctor, if you could "catch" your own germs back-ie if you needed to change or wash your own sheets more when you were sick to try to kill the germs. Long story short-he said #1 once you had a particular "strain" you really didn't get the same one again, so that didn't matter (now cross contamination with another family member who HASNT caught it is another matter) and #2 most germs etc actually die fairly quickly if they dry all the way out, it is just when they are kept moist and warm that they stay alive. So if the pillowcases fully dry out during the day, and don't have icky runny nose stuff all over them, then changeing them doesn't actually do anything to keep down the germs according to Dr. Ted. Just FYI. And of course that has nothing to do with it feeling nicer :) Thats a whole different issue. Oh, no, I didn't mean it as germ control--just comfort control!